Providing effective feature filtering – allowing users to narrow search results and / or navigate through a website by selecting multiple product features – can make a big difference to customer experience. Many people will only use the search option on an e-commerce site as a last resort, and most prefer to navigate through a site using links, because this requires less mental effort. This is where feature filtering comes in. Unlike standard e-commerce navigation, where the customer can only choose from a hierarchy of links chosen by the retailer, effective feature filtering allows the user to find their own route to a product, by combining features in different ways as they search the product range. It is important to get filtering right, and there are many mistakes which can be made. For example, much depends on the quality of the product descriptions and the underlying metadata. This is an area where many e-commerce sites can make improvements. For instance, in the last Online Retail User Experience Guide, we found that Currys omitted an entire range of high-price Dualit toasters when ‘2 slice toasters’ was selected, probably because their product description described them as ‘1 or 2 slice toasters’. So much for synonyms! 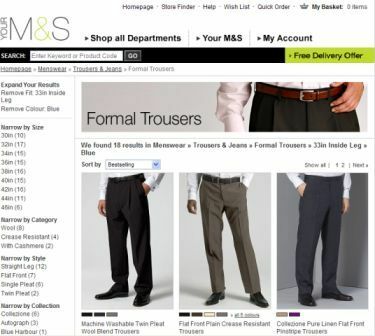 To see the effectiveness of feature filtering, try searching for a pair of trousers on two big brand retail websites: Next and Marks and Spencer. Marks and Spencer’s newly relaunched site makes use of feature filtering, while Next’s website doesn’t. 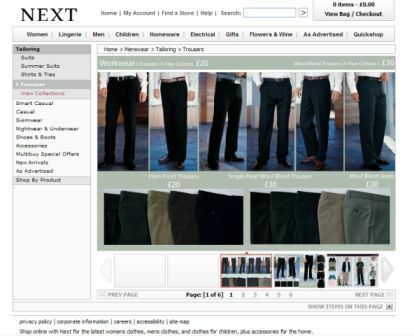 to find a pair of men’s trousers on Next, you select ‘menswear’, then ‘trousers’, and are then presented with six pages of catalogue-style shots, with no means of filtering the results further. So you need to manually browse each page in turn. Hmmm…. By contrast, the use of feature filtering on M&S makes the search much easier, much faster, and enables the customer to eliminate results. M&S allows you to filter your search by size, style, colour, price, and more, making it a far better plaftorm for relevant results. Ensure that product metadata is accurate –any missing or inaccurate product description data will result in missing products and irrelevant search results. Present relevant results only – this means showing only products that are in stock and available for purchase. Customers will be frustrated if they find the item they want, only to realise it is unavailable. Show the number of products matching the filter options – as above, show only results which are available to buy. Also, show the number of products for each for each feature value that can be selected next. Avoid returning ‘no matching products’ – this is guaranteed to annoy customers. One way to avoid this problem is to provide feedback after every new feature-selection. Letting customers select products on the basis of multiple criteria is a sure way to get lots of ‘no matching products’. Show the features selected so far – showing the selections a customer has made in their product search in a list or ‘breadcrumb trail’ will give the customer a shortcut back to any previous point in their selection history. In addition, customers should be able to remove or change certain product features without changing other selections, as they refine their search. Show the customer that they are making progress towards a purchase – this can be done by showing the number of matching products, and that they are reducing in number after each selection. Another way is to show selected features in a list, or allow customers to sort matching products in different ways so they can focus their attention on only the ones they are interested in. Online Retail User Experience Benchmarks guide. Jakob Nielsen’s latest article looks at site redesign tips which will lead to increased sales and improved customer loyalty. Nielsen has 10 redesign recommendations that are the most likely to increase return on investment for your website, most of which should be relatively simple to implement. Bowen Craggs has published a study on how the 60 biggest corporations’ sites rank in terms of serving the media, customers and investors. The FT Bowen Craggs Index studied 20 corporate websites from Europe, 20 from the US, and 20 from the rest of the world. Of the top ten websites, eight were from Europe, and two from the US. WebFetch is a search engine which claims to give its users the ‘best search results available on the web’ by combining search results from the major search engines. WebFetch’s search results can be displayed by relevance or by search engine, though you need to scroll down the page for organic results if you display Google and Yahoo results.